DBT Secretary, Dr Renu Swarup addressing the delegates at the launch of Startup Day by CII and AMTZ on 25th March. 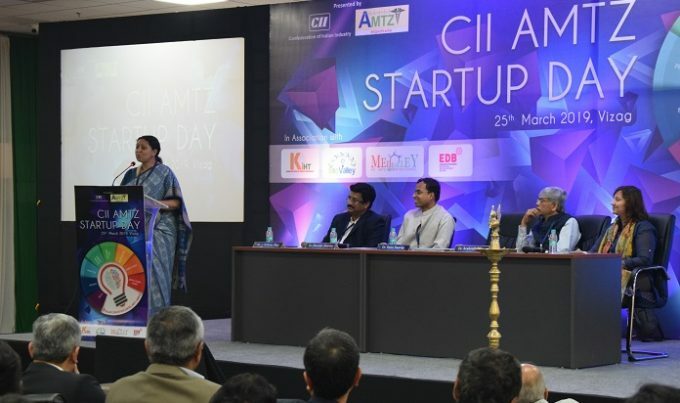 Visakhapatnam: The Andhra Pradesh Medtech Zone (AMTZ) in association with Confederation of Indian Industries (CII) has launched ‘CII AMTZ Startup Day’ at Kalam Convention Center at AMTZ Campus in Visakhapatnam. The entire effort is aimed at giving a much-needed push to the startup ecosystem, has been spearheaded by two of the biggest incubators housed within the AMTZ campus, Biovalley and Medivalley. More than 250 participants attended the event making it one of the biggest efforts in the startup ecosystem. Dr Renu Swaroop, Secretary, Department of Biotechnology, Government of India, graced the occasion as the Chief Guest and shared her thoughts. Dr Swaroop lauded the humungous efforts made by the Andhra Pradesh Medtech Zone under the leadership of Dr Jitendar Sharma, MD&CEO, AMTZ in a short time and setting the example for delivering quality with speed. She underscored the importance of bringing together of various stakeholders such as manufacturers, startups, financiers, incubates and various other policy making bodies such as WHO and CII. Dr Swaroop opined that this would definitely lead to bringing measurable changes in the startup ecosystem. In his opening remarks, Dr Jitendar Sharma set the context for the CII AMTZ STARTUP Day by taking the audience through the journey of making AMTZ, from excavation to Inauguration in 342. He recollected the immediate willingness of the Chief Minister of Andhra Pradesh, Nara Chandrababu Naidu to set up this zone and provide all the possible government support. He laid down and exciting path for this quarterly event which relies on outcomes that are measurable. Outcomes that would be achieved in a timebound manner with quality. He thanked the Department of Biotechnology and various other departments that have been supportive throughout this journey. Addressing the audience, Dr Arabind Mitra, Scientific Secretary, office of the Principal Scientific Advisor, Government of India, a Special Guest for the event stressed the need for treading the hard path and not being comfortable in treading a soft one. He remembered the famous words of Pandit Jawaharlal Nehru, “These are the temples of Modern Science”. He exuded confidence that with facilities like AMTZ showing the way, India will be on the global map of medical devices. Representing CII, Mr Srinivas Raju, Vice Chairman, Visakhapatnam Zone, recollected the origination of idea at the World Economic Forum at Davos. He said, going forward, CII and AMTZ would work together with various industry bodies, influencers, policy-making bodies across the spectrum and bring forth outcomes that are measurable and those that would be immensely beneficial to the start-up ecosystem. Dr Madhur Gupta representing the WHO India office took the audience through the journey of WHO in driving frugal innovations and various policy interventions in the area of medical technology and access to medical devices. The event was divided into four sessions. Each session had speakers from various segments starting with Industry leaders to patent service providers. The Key speakers included Dr Suresh Kumar, Scientist F, Government of India, Dr Alka Sharma, advisor, Medical Biotechnology Division, Dr Prakash Bachani, Head, BIS, Prof. B. Ravi, IIT, Mr Rajivnath, Forum Coordinator, AIMED, Mr Rajan Ghadiok, President, Asia Pacific Operation, SS Innovations, Mr Sunill Khurana, CEO & MD, BPL Medical Technologies and Mrs Himabindu, Managing director, Novel Patent Services. Stakeholders who participated in the event benefitted immensely from the eminent speakers and have expressed their interest for the second edition of the event. The event also saw participation from more than 100 startups, manufacturers, 3D printing agency, Think 3D and TUV Rheinland, Financiers such as HDFC, Yes Bank, SIDBI and SBI, Insurance provider, NTrust and students from universities like the GITAM University. A one to one interaction was arranged between all the above stakeholders in order to make this event more outcome-oriented and not just limit it to a conference. The B2B Mentors included Mr Aniruddha Rajurkar, Dr Reddy Labs, Dr Nita Sachan, Head Strategy, Cyient, Dr Pankaj Negi, President, Fuji-Astarael, Dr. V Satyanarayana – Managing Director, Sipra Labs, Mr Srinivas Savaaram, Managing Director, Alcove Ventures. The day-long session ended with a resolve to finding lasting solutions to the problems that are being faced by the Start-Up Eco System by involving all the stakeholders across the spectrum.